The trains remained stationary for more than 15 minutes and then resumed their run. Delhi metro services were disrupted for more than three hours, stranding thousands of commuters. 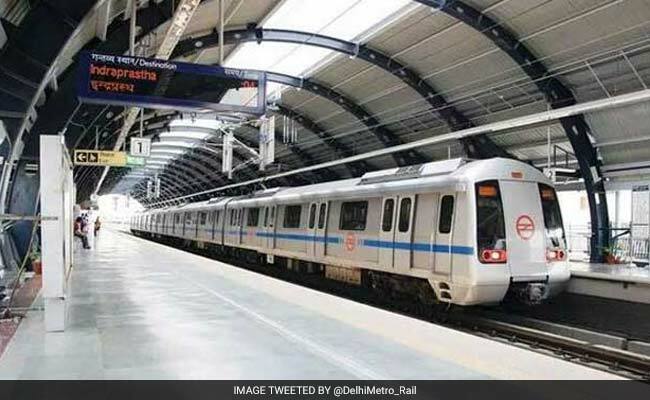 New Delhi: Services on Delhi Metro's Blue Line (Dwarka-Vaishali/Noida City Centre) were disrupted on Wednesday when a passenger got down and started walking on the tracks between Noida Sector 16 and Sector 15 Stations. The trains remained stationary for more than 15 minutes and then resumed their run at a diminished speed, due to the stray passenger. "The incident was reported to us around 8.45 p.m. The trains had started running only after slight delay. We decided to keep the speed slower than usual till we were sure that the culprit has been found, " a Delhi Metro Rail Corporation (DMRC) Official told IANS. The Central Industrial Security Force, (CISF) which is responsible for security at metro premises, didn't comment on the story and failed to confirm whether the man was found. The metro services on the same stretch were thrown out of gear yesterday when it suffered a short circuit by an eagle which flew into the over head wire near Yamuna Bank Metro Station. The services were disrupted for more than three hours, stranding thousands of commuters.